Our lab has been interested in studying this protozoan parasite for quite a long time, but certainly not as long as Leishmania spp. has been wandering around our planet. These parasites are ancient Eukaryotes that have retained the exosomal pathway throughout evolution, a mechanism used by some viruses like those of hepatitis C and A, among others. In other words, vesicles derived from infected mammalian cells, may also contain viral particles. Additionally, with this exosomal coating, protection to virions from a potential dangerous extracellular environment is possible, a coating which also helps with the infection of new cells. Chronologically speaking, mammals appeared much later on the evolutionary timeline of Eukaryotes. We are speaking about a gap of millions of years between the two groups. So, is it possible that this mechanism could have been retained since these ancient times and still be used by viruses infecting lower Eukaryotes like Leishmania spp.? Scanning Electron Microscopy of a Leishmania spp. parasite producing vesicles. Could these vesicles also be used by viruses as a camouflage and protection envelope? Interestingly, it has been demonstrated that Leishmania RNA virus 1 (LRV1)- infected Leishmania species are associated with a particularly aggressive mucocutaneous disease triggered in response to the dsRNA virus content. However, it is unclear how LRV1 is exposed to other mammalian host cells… any guess? Herein, we investigated whether LRV1 exploits the Leishmania exosomal pathway to reach both the extracellular environment and new eukaryotic cells to infect. 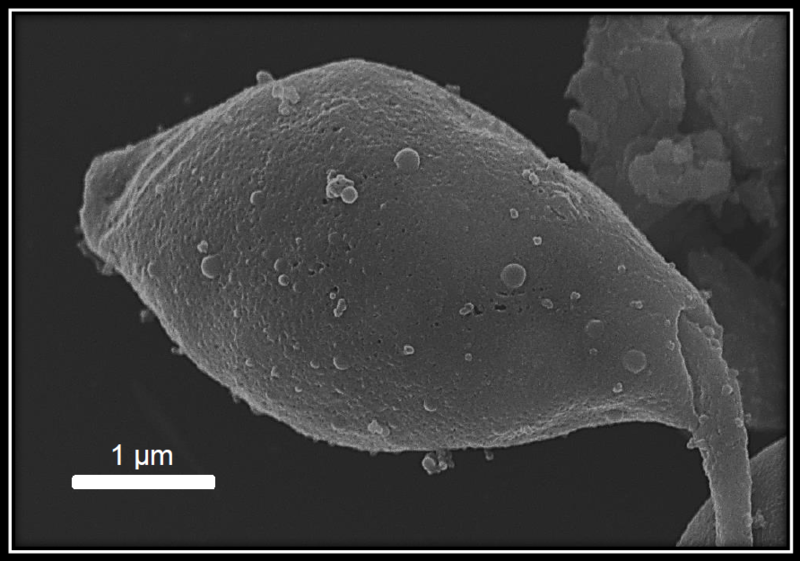 Electron microscopy analyses of exosomes derived from LRV1- infected Leishmania revealed that most dsRNA LRV1 virions were found together with exosomes, and that a portion of viral particles was surrounded by these vesicles. Not only this, but we also could visualize the emergence of vesicles either containing or lacking LRV1 particles on the surface of parasites. 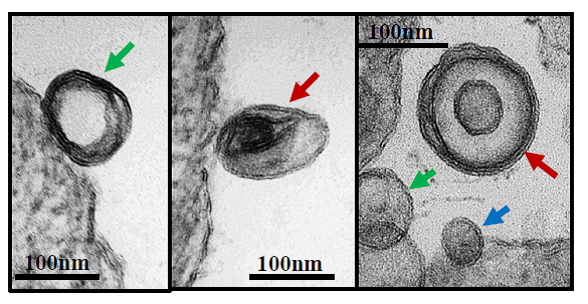 Transmission Electron Microscopy images of vesicles surrounding LRV1 particles. Red arrows, membrane-enveloped LRV1-like particles. Green arrows, LRV1-free vesicles. Blue arrows, naked LRV1-like particles. In vivo experiments on mice footpads. Lpa/Lmex = Parasites that do not harbor LRV1. Lg21+ = LRV1-harboring parasites. 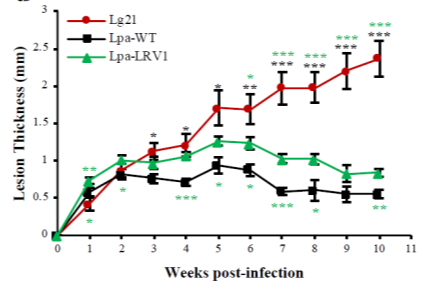 Mice that received Lpa/Lmex parasites in contact with LRV1+Exosomes (Green line – Lpa-LRV1) had an increased inflammation in comparison to the mice that received parasites without any exposure to LRV1 through Exosomes. (Black line – Lpa-WT). Following these findings, our group performed trans-well and transfer assays of LRV1-containing exosome preparations which showed that a significant amount of parasites were rapidly and transiently infected by LRV1. Parasites were put in two compartments separated by a membrane. This separation membrane was only permeable to vesicles, but not whole parasites, meaning that the only way an interaction occurred between Lpa/Lmex, a species that did not harbor LRV1 and Lg21+, a LRV1-harbouring species, was through vesicles secreted by the parasites. Remarkably, these freshly infected parasites generated more severe lesions in mice than non-infected ones. Moreover, mice co-infected with parasites and LRV1-containing exosomes also developed a more severe disease. Overall, the work from our group provides evidence that Leishmania exosomes function as viral envelopes or disguises, protecting them from many dangers of the extracellular environment and facilitate LRV1 transmission to naïve parasite, leading to an increase of their infectivity toward the mammalian host. Could this be happening in other lower eukaryotes and viruses? If so, how is this protection technique important in the pathogenesis of other viral infections and parasitic diseases? There are many questions to be asked and hopefully many answers will follow them. Brazilian M.D trained in the Amazonic State of Pará. Training in Molecular Biology at McMaster University and the University of Toronto. Interested in understanding the pathological nuances and particularities of the many Infectious Diseases, especially the Tropical ones. Cutaneous Leishmaniasis is my main area of study with a particular interest on Leishmania-derived Exosomes.